Team Zoysia is a worldwide organization of professionals dedicated to the utilization and management of zoysiagrass as a sustainable turf. Members include Bladerunner Farms, Doguet Ventures, The Turfgrass Group and Team Zoysia International. International members include Sports Turf Solutions in Southeast Asia, Novogreen in Spain, GramaFina in Panama, and Lawn Solutions in Australia. Team Zoysia-Asia is the member with a principle presence in Korea. (1063-01) Not just for tees and fairways anymore, zoysiagrass is now a viable option for greens. And that’s not marketing hype. Five Ph.D.s and other turfgrass experts explain why they believe zoysia for greens is now the real deal and how you can implement its use on your golf course. Calling all GIS attendees interested in learning more about managing zoysiagrass on their golf courses: This is the seminar for you! Check in will be first thing in the morning in the lobby of the Henry B. Gonzalez Convention Center. Travel time from the convention center to Bladerunner Farms in Poteet, Texas, will be approximately 45 minutes. 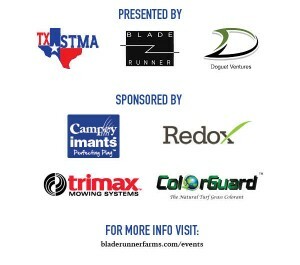 Lunch will be provided on site at Bladerunner Farms (heated facility reserved nearby in case of inclement weather). Buses will board at 1 p.m. to travel to Oak Hills Country Club to tour the newly updated zoysiagrass golf course with the architect and superintendent to conclude the reminder of the field trip. Attendees are encouraged to wear walking shoes and comfortable apparel. Members will receive 0.7 education points for this Learning Tour. Registration fee is $195. Click here for more information or to register for the learning tour! 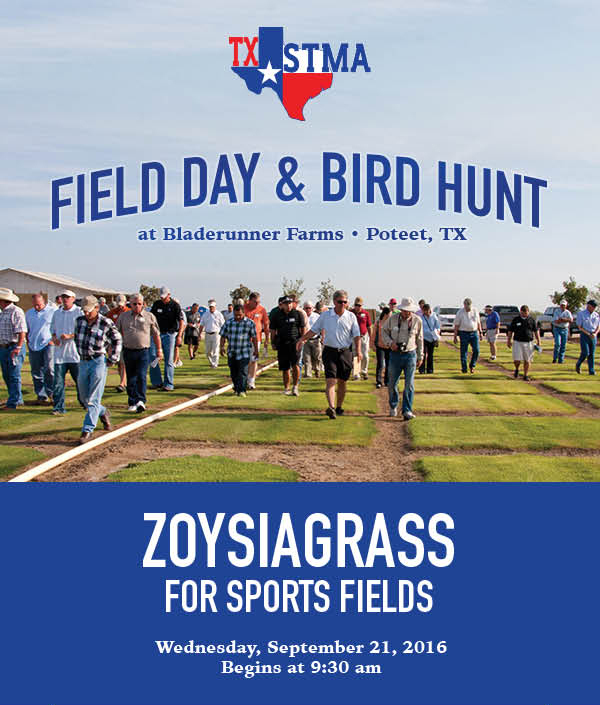 Join us Wednesday, September 21st as Bladerunner Farms hosts the Texas Sports Turf Managers Association Zoysiagrass Field Day & Bird Hunt. With a wide range of temperature and geographical adaptability, tolerance to varying pH levels and soil types, extremely low nitrogen input requirements, built-in mechanisms to extract salts from the soil, and a full spectrum of leaf textures- from fine to coarse- Zoysiagrass, as a family of grasses, offers the greatest versatility and utility of any of the warm-season grasses available today. 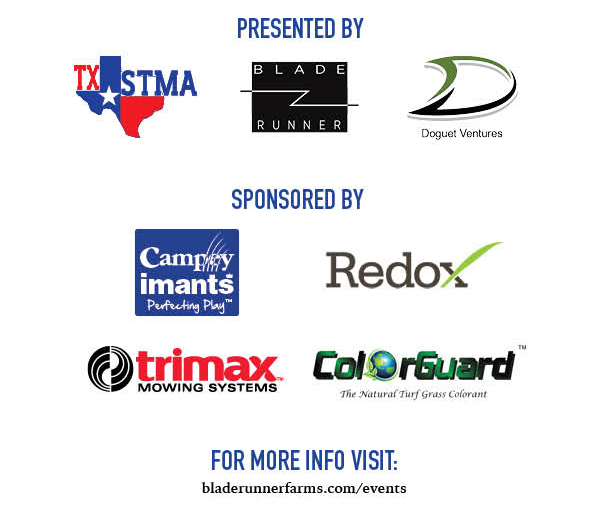 The Texas Sports Turf Managers Association (TXSTMA) was established in 2004 by merging the North and South Texas STMA chapters to better serve the sports turf professionals and industry in Texas. TXSTMA is comprised if professional turf managers from colleges and universities, parks and recreation, school districts, private facilities, professional sports, researchers, commercial suppliers and students working in or interested in sports turf management. Bladerunner Farms is the world’s largest privately owned zoysiagrass research and development facility. The grasses developed by Bladerunner Farms are some of the most advanced, environmentally friendly, drought tolerant grasses available on the market today for use on home lawns, golf courses and sports fields. If you’re dealing with water restrictions, drought, shade or extreme weather, Bladerunner Farms can help you to create a beautiful sports turf facility with grasses on the cutting edge of turfgrass technology. In the turf industry, the Doguet family name is synonymous with zoysiagrass—and for good reason. 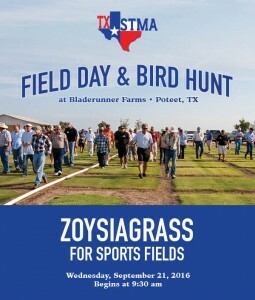 Renowned Turf Breeder David Doguet is the president of Bladerunner Farms, the largest privately held Zoysiagrass and Buffalograss breeding and research facility in the world. The company has researched and released grasses for more than 30 years. Doguet Ventures, a licensing agent for all Bladerunner Farms varieties and other premium grasses, is owned by David Jr., Daric and Darin Doguet, who are the sons of David, Sr. Our scientifically developed grasses are farm-tested. Our family has a long history of growing and developing environmentally friendly grasses with lower water use requirements, low fertilizer requirements and fewer overall inputs. David, Jr., Daric and Darin grew up on their father’s turf farm, and for the past 15 years they have each had a part in the company’s success. In 2012, the Doguet brothers approached their father about a collaboration. The idea was to create a company of their own and work synergistically with their father’s company, becoming the licensing agent for all Bladerunner grasses, both Zoysias and Buffalograsses, and other premium varieties. That company became Doguet Ventures. Campey Turf Care Systems and Imants BV combine to offer professional sports turf managers, golf superintendents and park managers the best quality maintenance equipment, honest advice and technical support. We supply to all levels of sport from the grass roots to some of the largest and best known sporting venues in the World. Together we deliver innovative, efficient equipment to the market place, with both companies recognizing the value of integrating skills, experience and knowledge to meet a common goal and purpose. As well as researching and developing machinery and techniques for implementing best practice, we actively encourage education of sports turf maintenance. This primarily through initiatives run by the industry’s professional associations, such as advisory bodies, consulates, sporting governing bodies and the associations and agricultural colleges. This is to provide sound advice and practical help to all of our customers of today and in the future. We are the innovators changing the way grass is kept healthy and green all year round regardless of weather conditions. Every new customer we introduce to our service to is instantly amazed at the results. That’s because Green Up Grass Treatment contains natural nutrients and pigment that is immediately absorbed into the grass blades ” Instantly” restoring the health and natural green color. Our service is designed to reduce costs associated with traditional lawn care practices! We provide both our Commercial and Residential customers with a customizable approach to instantly restoring and maintaining the natural green healthiness of the grass all year long. We recognize that everyone wants to have the best looking lawn possible. Our fully trained professional service providers will design a program that fits your needs but most of all produce instant results you can see once we spray the grass. We stand behind our services 100% and when you become a customer you will too! The mission Redox began in 1992. In many ways, it begins again every new season. Our roots are firmly embedded in the agriculture industry, the reason our knowledge and passion run so deep. The result is a collection of products and experts that help customers grow beyond what’s expected. The focus of Redox is in four main areas- soil chemistry, plant nutrition, water & salinity management, and root strength. With the being the foundation for all we create, growers are discovering healthy plants and high crop yields with an environmentally responsible approach. Through proprietary nutrient complexing and chelation, and a production process incorporating both chemistry and biotechnology, we offer solutions that are the most efficient in the industry. Each grower has unique requirements due to water and soil conditions, nutritional needs of a particular plant, and variations in climate. For this reason, we have developed an exceptional technical service system that derives the fertilization recommendations from highly advanced analysis of the soil, the plant, and careful follow-up during the growing cycle. With this information, our team provides site-specific solutions so our customers can grow beyond expectations. Trimax Mowing Systems is a family owned company that designs, develops, manufactures and distributes tractor-powered mowing equipment. Our aim is to create mowing solutions which focus on low Total-Cost-of-Ownership and a long commercial life. We design products which are safe, efficient, intuitive to use and present consistently well in both fine turf and demanding commercial conditions. As a company we endeavor to treat all customers, staff, suppliers and partners as family. From our service and support, to product demonstrations and dealer engagement, we seek to deeply understand our family and provide innovative solutions to meet their needs. By continuing to listen to and partner with our family members we will continue to release consistently innovative and sustainable products to the world. The Snake 320 has a lot of the design characteristics of its big brother, the Pegasus, which has been sold in the United States for 12 years, into Turf Farms, Sports Fields, School Districts, Golf, and Polo. It uses the Trimax Lazer Blades and other quality componentry and carries the Trimax 3 Year Warranty. The Snake has a slightly higher tip speed which results in finer clippings, better distribution, and less clumping in damp conditions. It has full width rollers to minimize scalping, allowing the operator to mow very low, on Bermuda, and Zoysia grasses, with peace of mind. The Snake also has the added feature of the ‘Kerb Jump’, which enables the decks to be raised off the ground to traverse concrete paths and obstacles, without interruption to mowing. It also comes with greaseless spindles, which result in less down time and maintenance costs. Although Snake was designed with golf in mind, it has found a home in sports field mowing, schools, universities, small turf farms for seed plot mowing, polo, and private housing estates. There is no question that the Snake is the most versatile tractor pulled mower available in the market today. The Striker has the same renowned pedigree as the Snake and also utilizes the Lazer Blade system. It is lightweight and can be fitted to 25-45 HP tractors via the 3-point linkage. It also carries the Trimax 3 Year Warranty and is the perfect partner for sports field mowing, seed plots, schools and universities, as well as private homeowners. If you’re looking for exceptional presentation, with amazing striping, on warm and cool season grasses, then look no further than the Striker. It comes in 61” and 76” widths, so there is bound to be one that will suit your application and tractor. Golf Industry Show – San Diego – 2016: Is the Year of Zoysia! 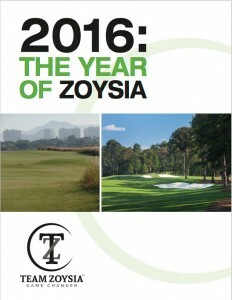 Team Zoysia Booth #3657 Celebrates 2016 as the Year of Zoysia. This year, the world’s most high profile golf projects chose Zoysia as their playing surface. These include: The golf course at the 2016 Rio Olympic Games; Tiger Woods’ first US course, Bluejack National; Trinity Forest, new home of the AT&T Byron Nelson; and The Golf Club of Texas, the world’s 1st 100% zoysia course. Meet the grass experts who helped bring these projects to fruition. David Doguet, who bred & developed the Zeon, L1F, and JaMur Zoysia varieties used on these courses; Dr. Milt Engelke, one of the world’s most renowned zoysiagrass researchers; Ken Mangum, CGCS, one of the country’s most respected zoysiagrass superintendents, and others. Zoysia has many environmental, sustainable attributes including very low nitrogen requirements, less water and less mowing. Plus, its upright nature makes the ball sit up as if on a tee. 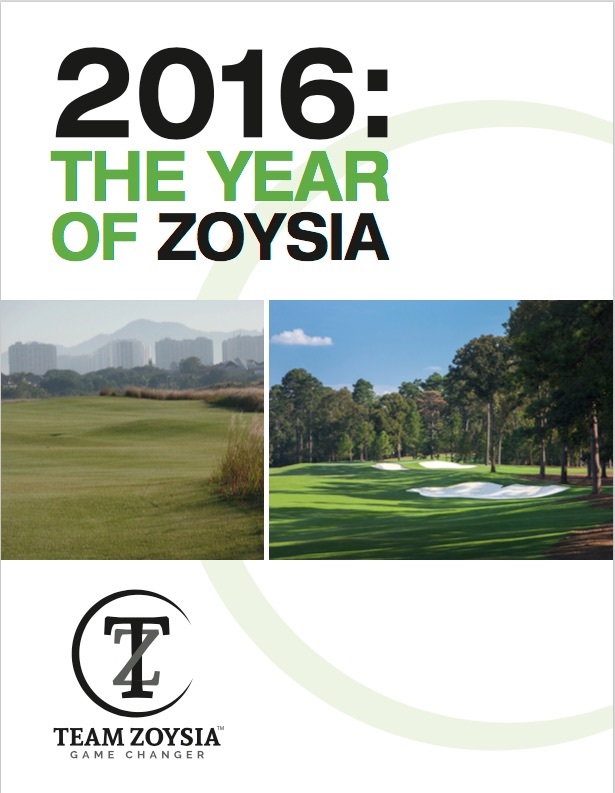 For these and many more reasons, 2016 is the Year of Zoysia. Members will receive 0.7 education points for this Learning Tour. From Illinois to South America, golf courses are converting to drought-tolerant zoysiagrass. Meet the team planting zoysia on the new Rio 2016 Olympic Golf Course in Brazil; tour Bladerunner Farms, the world’s largest privately owned zoysiagrass research facility; learn about the latest university research and get a firsthand look at zoysia planted from tee to green; and tour the golf course to see the complete zoysiagrass renovation of the Golf Club of Texas, right here in San Antonio. Attendees will have the opportunity to meet and talk with the staff and personnel responsible for the renovation. Following a tour of the course, we’ll go into the clubhouse for a moderated panel on building the Olympic Golf Course. Texas-style BBQ lunch is included. Space is limited and registration will not be available on-site. Please register by Jan. 30. Meet at 8:00 a.m. in River Room 001A in the Henry B. Gonzalez Convention Center to check in. Please be on time, the buses will leave the Henry B. Gonzales Convention Center promptly at 8:15 a.m. Wear comfortable shoes. In case of inclement weather, rain slickers will be provided for attendees, and some activities will be moved indoors. RSVP Today! Seating is limited and this tour is expected to sell out! Dr. Brian Schwartz and Bladerunner Farms staff members report on the best and most interesting zoysiagrass crosses from the Bladerunner/UGA collaboration . More than 200 sod producers and turf industry professionals toured the Bladerunner Farms research facility in February 2013 as the closing night event of the TPI Midwinter Conference. Visit our Facebook page or read the article from Turfgrass Producers International.